Why Does London Have So Many World's Ends? James FitzGerald Why Does London Have So Many World's Ends? For some, it really did represent the apocalypse: the World's End estate in Chelsea. Photo: Torsten Reimer. It's become a Londoner's cliché to embrace, tongue in cheek, the view that our city is the centre of the universe; that the north begins at Watford, and that beyond there it's just badlands and orcs. With or without irony, locals seem to have been doing that for centuries. How do we know? Well, wherever you are in the city, just ask yourself how many times you've come across a 'World’s End'. It's found on pub and street signs, and even in business names. But rather than referring to anything apocalyptic, the phrase is actually just a common place name which suggests a boundary of some sort. So how did we 'end' up with so many? Imagine a time before Pokemon Go was telling us to follow our GPS to the corners of the globe — or even to Morden — in the hope of catching a wild Zapdos. Imagine a time when planet Earth felt a larger place; its citizens fewer in number and much more remote from one another. London wasn't born as the fully-formed dazzling metropolis we know today. Its development was gradual and bitty, as lots of separate villages like Clerkenwell and Islington sprang up, then grew and blended together over time. It was less a unified city, more a collection of fields dotted with parochial little farmsteads. Each of those is peopled by folks with a distrust of what lay beyond yonder field. They felt they were living at the very edge of civilisation. The World's End pub in Camden. Photo courtesy of catya_maria007 in the Londonist Flickr pool. 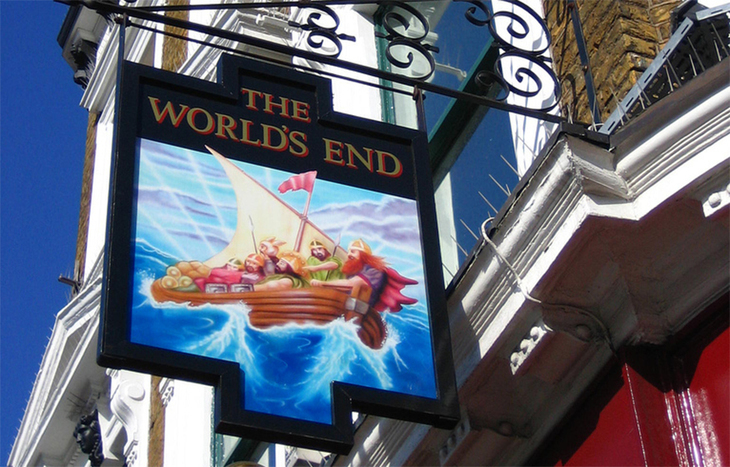 A 2013 film with Simon Pegg and Nick Frost is named after a fictional pub called the World's End – and it does seem that nowadays, the humble tavern sign is the commonest place the phrase is seen. A quick online trawl brings up records of closed World's Ends from Stepney to Southwark, Hendon to Havering. Drinkeries bearing the name are still in business in Finsbury Park and in Hampton near Twickenham. The latter place tells us there's been a public house with that name there since 1729, when all you could see beyond was open countryside. 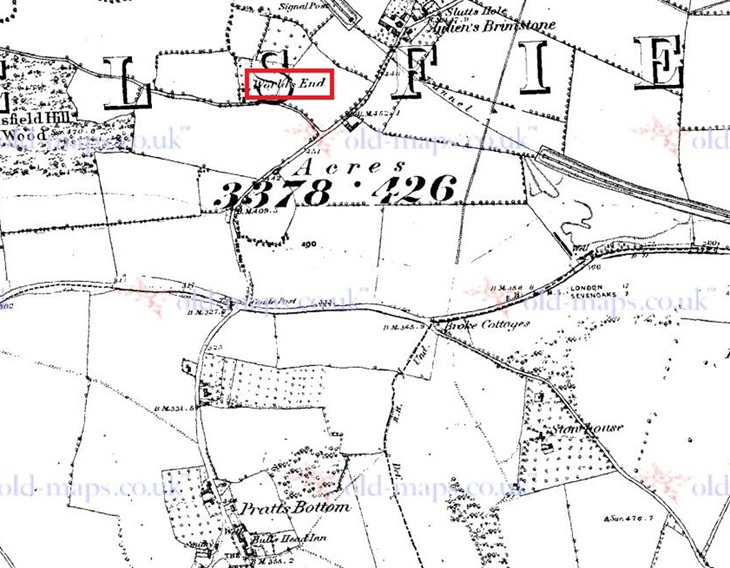 World's End highlighted on an 1871 Ordnance Survey map of Chelsfield. Spot the Slutt's Hole and Pratt's Bottom, too. It seems quaint to think about a relatively urban area viewing itself as a 'point of no return' in bygone ages. But the World’s End phenomenon is reflected in the names of neighbourhoods which survive in London to this day. Take Chelsfield, in the borough of Bromley. There was a World's End here - just west of an area named Slutt's Hole, and north of another area named Pratt's Bottom. (Clearly, this really was the arse end of nowhere.) And it now gives its name to a winding country lane. But arguably the most notable area which still flies the World's End flag is in Enfield. The name seems to have arisen as a way of demarking the edge of the church parish in the 18th century. Google still acknowledges it as a place even now, as does Ordnance Survey. 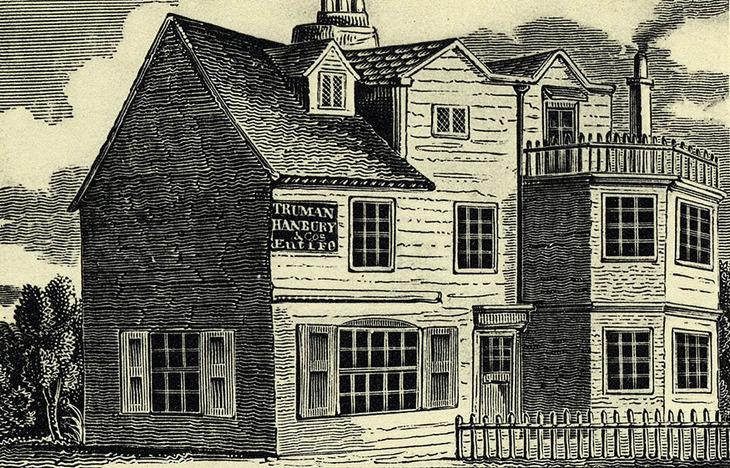 The World's End tavern in Chelsea as it might have looked in 1830, according to a later artist. Image courtesy of the Royal Borough of Kensington & Chelsea. We love the World's End name, and think it's no surprise it caught on all over London’s different villages. And you can see its legacy all over the place — even in a south London tiling firm. But nowhere has embraced the moniker quite like Chelsea. The World's End pub here (which still exists, under a slightly different guise) dates back perhaps as far as the 17th century and, customarily, got its name because it was a traveller's last place of refreshment for some time. And now, the name is unavoidable in the area. Among other things, it’s enshrined in a Vivienne Westwood boutique on the King's Road, in a forebodingly-named health centre, and even in a council estate. That particular housing development proved immensely controversial from the 1970s and beyond. But you could say that there's hardly a better way of immortalising history than in thick, brutalist concrete. Certainly that's lasted better than a certain short-lived BBC Two soap opera set here in Chelsea in the 1980s, as remembered by local historian Dave Walker.